I Chronicles 11: 4, 5 - "And David and all Israel went to Jerusalem, which is Jebus; where the Jebusites were, the inhabitants of the land. And the inhabitants of Jebus said to David, thou shalt not come hither. 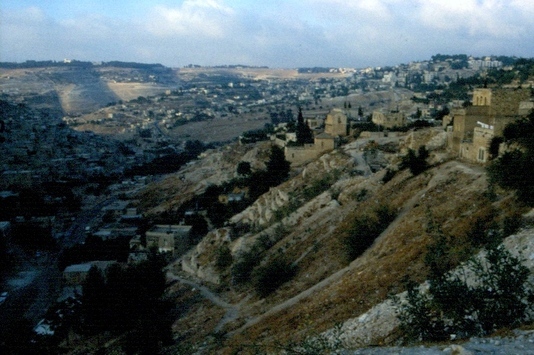 Nevertheless David took the castle of Zion, which is the city of David." The castle of Zion that is mentioned in I Chronicles 11: 5 is none other than the entire city of David itself. By the Late Bronze Age, the Jebusites had constructed a protective wall around the city and they felt secure inside their, 10 acre, strong hold. II Samuel 5: 6, 7 tells the same story about King David's arrival - " And the king and his men went to Jerusalem unto the Jebusites, the inhabitants of the land: which spake unto David, saying, Except thou take away the blind and the lame, thou shalt not come in hither. Nevertheless David took the strong hold of Zion: the same is the city of David." Notice that, in this telling of the story, the city of David is called the strong hold of Zion. Millo - I Chronicles 11: 8 and II Chronicles 32: 5 (Yes, Millo refers to the entire 10 acre site! See our Millo page).